Above: In the United States, the SK-II Facial Treatment Cream Foundation comes in a rather limited five shades, which collectively are for those with light to medium skin tones only. This image was taken with artificial indoor lighting. Above: The SK-II Facial Treatment Cream Foundation has 0.7 ounces of product and comes in a luxe frosted glass jar with a heavy metal lid which reminds me of the weighty metal tops of Laura Mercier fragrances. Ensuring that skin stays on its way to crystal clarity throughout the day is SK-II's first-ever foundation with concentrated Pitera. This SK-II cream foundation also contains Marine Sterol, an emollient ingredient derived from a species of seaweed in Brittany, France and Rice Sterol, extracted from Japanese rice bran. Combining the benefits of even coverage and a translucent, radiant finish with the luxurious texture of a skincare cream in a single product, it delivers a radiant, translucent finish while caring for the skin. Ingredients: Galactomyces Ferment Filtrate (Pitera), Aqua, Titanium dioxide, Cyclomethicone, Isotridecyl Isononanoate, Butylene Glycol, Niacinamide, Talc, Diphenylsiloxy Phenyl Trimethicone, Glycerin, Dextrin Palmitate, Dipropylene Glycol, Ethylhexyl Methoxycinnamate, Dimethicone, PEG-9 Polydimethylsiloxyethyl Dimethicone, Sorbitan Isostearate, Phytosteryl Rice Branate, Tocopheryl acetate, Aluminum Hydroxide, Panthenol, Propylene Glycol Dicaprylate, Disodium Stearoyl Glutamate, Gelidium Cartilagine. Above: SK-II foundation shades in the shade. 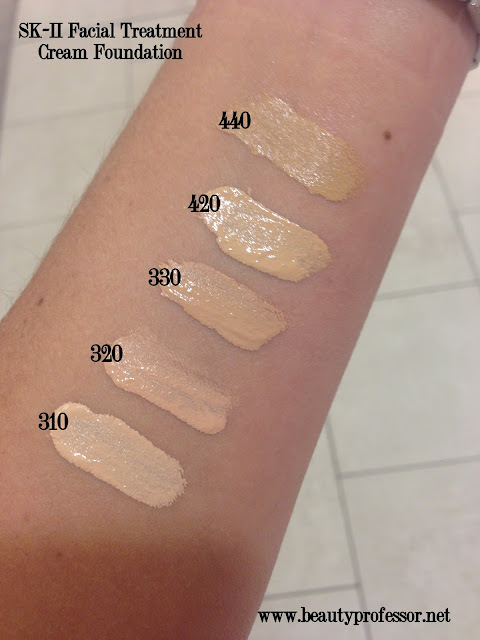 I procured my SK-II foundation from Saks Fifth Avenue...initially, I was vacillating between #420 and #440 while at the counter, so I swatched all five shades (it's wild when every visit to a cosmetics counter inspires a blog post...every swatch becomes more strategic than it should be!) and marched outside for an impromptu photo session. I even added two foundation shades that I had in my makeup bag for comparison. As far as I can ascertain, there are no images on the Internet that show all five SK-II shades side by side, so I hope this is helpful for those who are interested in this luxe and remarkable product! 1. 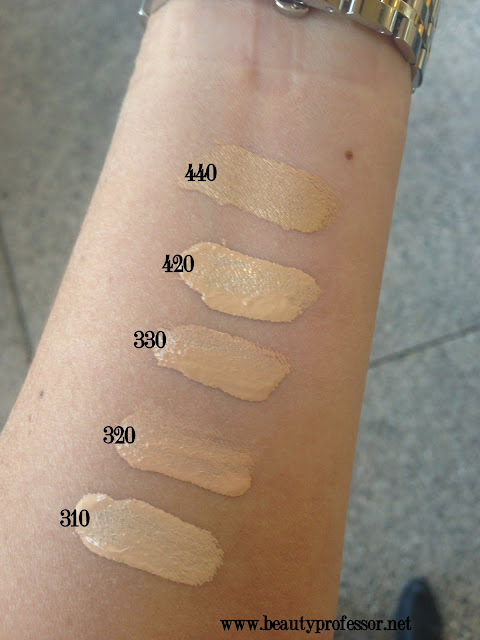 #310 is a very light neutral ivory beige for fair skin. 2. #320 is a light pink-peach beige for fair skin. 3. #330 is a light peachy beige for light skin. 4. #420 is a light beige with pronounced yellow (not orange!) undertones. 5. #440 is a light-to-medium beige with very warm golden undertones (I would completely embrace this in late spring and summer). Above: All five shades in direct sunlight. Above: Side by side image of #420 and #440...#440 is just hair deeper and peachier/warmer. 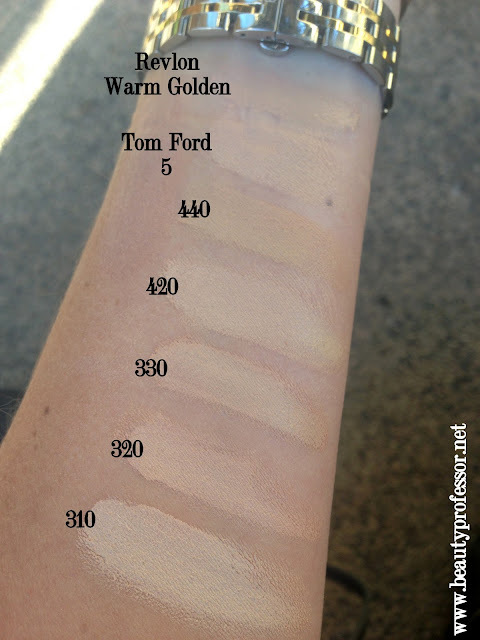 Above: Blended swatches in the shade...plus Tom Ford Traceless Foundation Stick #5 (closest to #420) and Revlon Colorstay Whipped Cream Foundation in Warm Golden (closest to #440). Upon settling on #420, I had to work out the best way of applying this foundation. Its texture is creamy and thick, but less dense and emollient than the Revlon Colorstay Whipped Cream Foundation. Also, because it is so pigmented, a little goes a very long way. In turn, it is likely that the .7 ounce jar could easily last a year, even with regular use! To apply, I dab about eight little dots of the foundation all over my face (over my beloved Le Metier de Beaute Peau Vierge, of course). Then, I blend it into my skin with my fingers and buff it ever-so-lightly lightly with my Sephora Airbrush for a uniform finish. This is one foundation that seems to work better with fingers (it just melts into the skin...perhaps it is the heat?! ), rather than a brush or sponge. 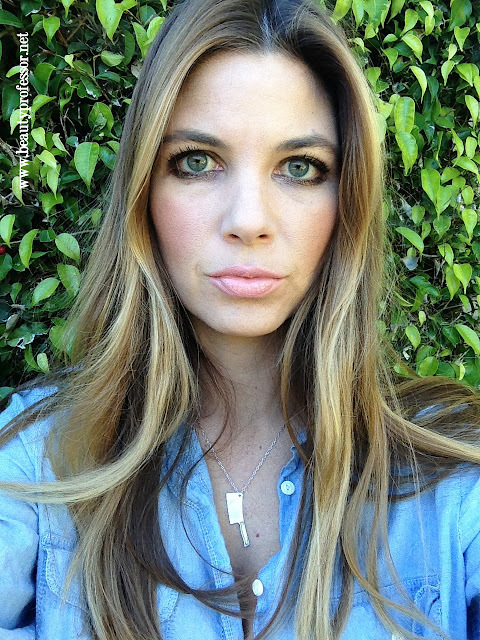 The finish is a beautiful, almost airbrushed satin matte that makes my skin look very even, yet natural. In terms of staying power, it lasts about eight hours without a drastic need for touch ups. It doesn't get cakey, doesn't increase oiliness and doesn't transfer or "move" on my face as the day goes on. I love that my skin feels balanced and comfortable when I wear this, and it feels even better (smoother and softer) when I remove it before bed. Finally, it is delightfully fragrance-free and my ultra-sensitve skin hasn't experienced an ounce of irritation or anything resembling a breakout over the past month that I've used this. 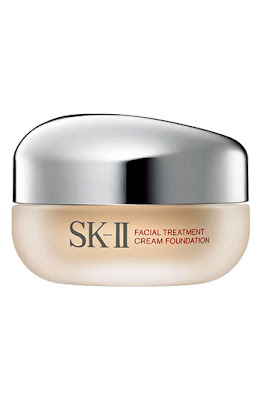 Bottom Line: I am quite pleased with the SK-II Facial Treatment Cream Foundation thus far...it is extremely pigmented, has lovely medium to medium-full coverage, lasts for the larger part of the day and has a plethora of skin care benefits. 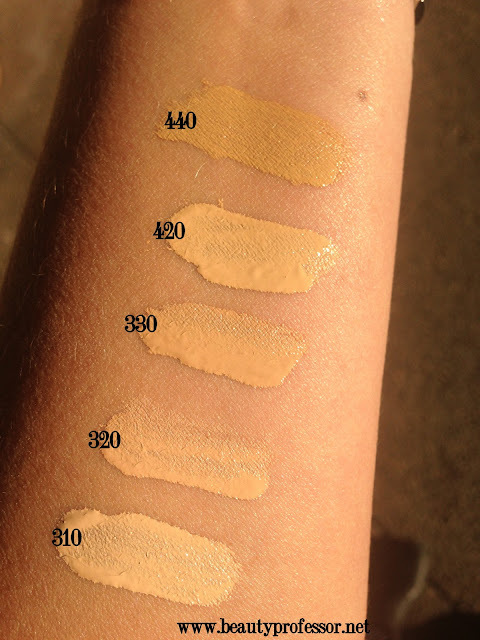 The shade #420 is a precise match for my "dead of winter," NC 23-25 skin and the fact that it doesn't oxidize over time is greatly appreciated. At $95, this is not a foundation to buy on a cavalier whim; however, the fact that it is an aesthetically excellent foundation and a premium quality skin care treatment may help to justify its cost. I recommend this for those who on a "foundation quest" (like I am!) and are looking to try something less mainstream from a highly respected line! Thank you so much for reviewing this I have been trying to find swatches of this for weeks now. I am very fair like Cate Blanchett and I am SX02 in the Kevyn Aucoin Sensual Skin Enhancer. Would the 310 be a good match? Thank you for always posting the full ingredients. I have very sensitive skin with allergies. I am so glad that my swatches and the ingredients list were useful for you! I was hoping that would be the case! In light of your match to SSE #2, I think that #310 would be a fantastic choice. This foundation is rather hydrating, but fortunately, it doesn't get too dewy over time. My skin just feels very balanced during and after wear! Thank you for providing these swatches...it is so nice to see a full range and comparisons!! This foundation looks lovely, the fact that it has skincare benefits is such a plus and a great excuse to procure yet another wonderful foundation reviewed by you;). Beautiful product. Beautiful model. You had me clear up until the price tag. Darn! But it is fascinating to be along with you on your foundation quest. BTW, what brush(es) do you like best for blush? Someday I want to get a nice one. My MAC 109 is barely cutting it for me. Have you tried the NARS Yachiyo? Would it be versatile and long lived enough? Thank you so much, Delacotta!! Such a joy to hear from you...I agree, this is totally an investment. My foundation quest seems to know no end ; ) For blush, I use two...I love the Sephora Pro Angled Blush Brush (#49) for adding contour (like Tom Ford Shade and Illuminate or Chanel Notorious) and for blush, I use the Sephora retractable blush brush...it is always in my makeup bag! I know many bloggers pursue luxury brushes like they do difficult-to-find makeup, but I am satisfied with the simple and easily accessible in this area! I haven't personally tried the NARS Yachiyo, but it is a lovely looking instrument indeed! I am so glad that you were able to stop by...the last two weeks have been crazy for me too, so communicating is always a bonus! I am indeed staying safe, thank you...I'm actually on the West Coast in Southern CA so we are cold and there has been a bit of rain, but our weather is never worthy of complaint!! Well, of course after reading today's blog, I realized you are in CA...doh! Chalk it up to my menopausal brain. I've been preoccupied with a sick kat that will not eat. Except barely enough to stay alive. (He is The Delacotta) and thus a Special Kat. You are too funny...no worries...so many blogs to keep up with!! How is the weather in Hawaii right now? I am so sorry to hear about your cat...poor little Delacotta...that has got to be stressful! I will make sure to pray for him. Always a joy to hear from you...a makeup shopping trip together would be a blast! Actually I'm in Washington state. There, we're even! But yes, I'm on a small island. I discovered tuna fish liquid poured on a little cat food tempted him tonight. How silly of me...I really took a leap when I heard you mention "Island!" I've been to Whidbey Island in Washington...are you near? Glad to hear that tuna is enticing your cat these days...hope it persists! 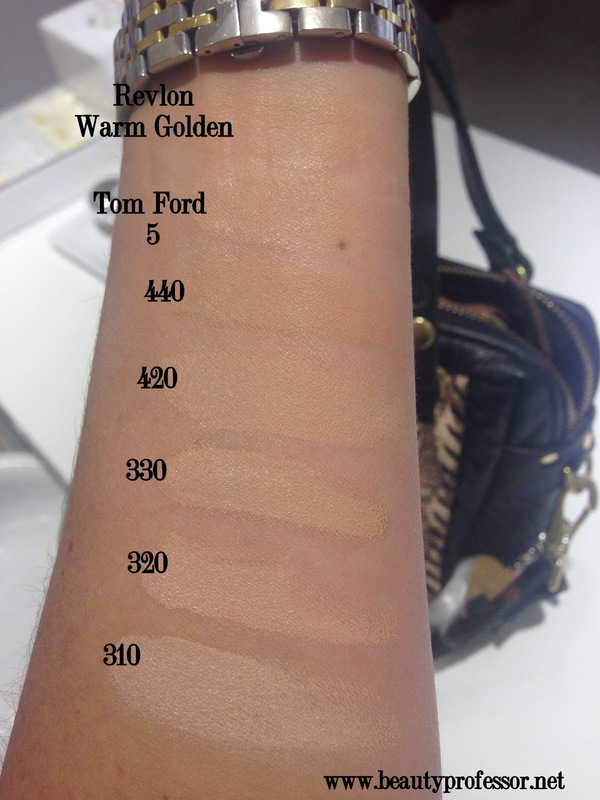 You would love the Tom Ford counter...so sleek and minimalist with a plethora of products, just waiting to be swatched. He just came out with a new installment of sheer lip color that I am waiting to see in person...alas, it wasn't at Neiman's in BH when I was there last week, so I shall have to be patient. I love MonsiieurAlex...so kind...he and actually live in the same area! Yes! I am extremely near Whidbey Island! (We hear those planes go over!) So cool you've been here. How funny you live near MonsiieurAlex - I just "met" him and we've hit it off! Of course I'll keep commenting on your blog (but it doesn't tell me when you reply), but I can tell you more about like where I live etc. on a less public format. Excellent...now, I have a much better sense of where you are located. I visited there with my family years ago and was entranced by how peaceful and quite it was (sans the overhead planes, of course). We had a wealth of sunshine today, however, the air was quite cold--50's all day! Ah HA! If I was only that observant and could (would) actually read instructions....LOL. Thank you so much for your research for me on the follow up. Thanks so much, Ellie! I think this foundation could definitely work on 24 year old skin...while it contains skincare elements, there is nothing overtly "anti-aging" about the elements and the smoothness, coverage and lasting power are divine! I have been reading your numerous foundation reviews and your reviews are AMAZING. I was wondering which foundations you would recommend for an indoor air-conditioned wedding that will look good photographed, won't be cakey and lasts long. I'm 30 years old with combination skin that tends to be oily on the T-Zone and dry on cheeks with somewhat enlarged pores on the nose. I was thinking: Giorgio Armani Luminous Silk Foundation, Kevyn Aucoin Sensual Skin Enhancer, SK2, Tom Ford Traceless Foundation or Make Up Forever Liquid Lift Foundation. But I am also open to other suggestions that might be better than all of the above... nowadays it is so confusing to choose one foundation over the other. You seem to know your foundations very well. I would appreciate your suggestion. Thank you so much!!!! Thank you so much for your kind words about my foundation reviews...I am happy my obsession can be helpful to others ; ) With regards to your question, I suggest the Tom Ford Traceless Foundation (applied over a primer and buffed in with a brush, this gives great lasting full coverage), the Hourglass Immaculate Foundation (medium to full coverage, long lasting and a beautiful satin matte finish...should have a post up on this tomorrow!) and the By Terry Cover Expert foundation (a full coverage foundation with a velvet finish). The SK-II is great but very pricy and I am also experimenting with the Kanebo Sensai Cream Foundation which I am loving, but it is quite expensive as well. Luminous Silk gets too dewy for me and the coverage is too light, the KA SSE is wonderful, but I mix it with another foundation to get the texture I want (it is very concentrated) and I haven't tried the MUFE Liquid Lift (that's the one MUFE formula I haven't experienced!). I hope this helps you and wish you the best at your wedding...do keep me posted on what you decide upon! Thank you so much Beauty Professor! This helps me a lot in choosing foundation. I will be waiting for your post on the Hourglass Immaculate Foundation. I think you give much better opinions than all the SA at Sephora. So glad that you shared your obsession and give wonderful advices at your blog! I'll keep you updated on what I'll decide to wear and my experience with it. Thank you again! You make my life easier! Thank you for the colors. I think you're the only person who actually showed all the real colors! 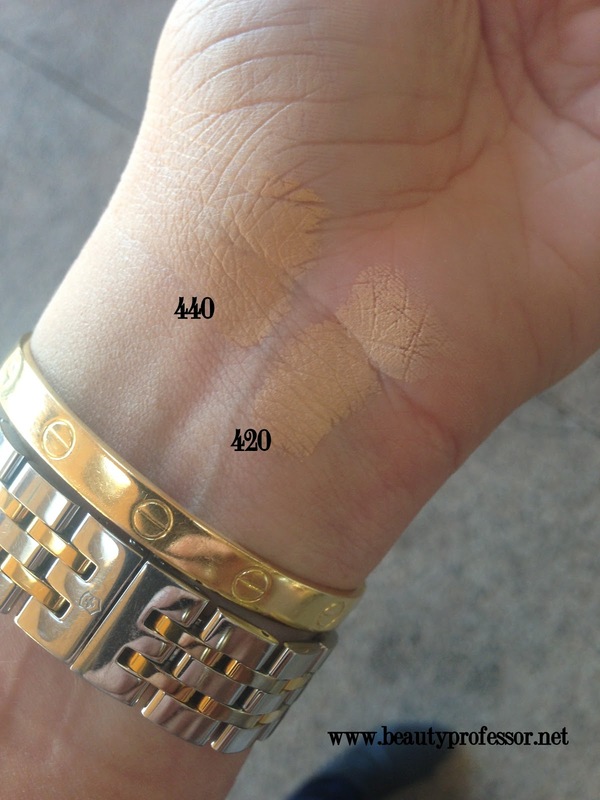 Happy to oblige ; ) I am so happy that this post was helpful for you and hope you enjoy #420...such a fantastic light yellow beige in a gorgeous formula.